Shaq Thompson: Talented defender, but where will he play? 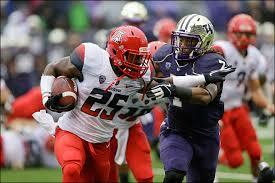 S/LB Shaq Thompson, Washington 6’ 228 lbs. Cons: His size is that of a traditional NFL safety, not of a linebacker as he is more long and lean than stout and muscular. His timed forty at the Combine of 4.64 is not outstanding either, but well within a slower defensive back or slightly above average linebacker. My first concern is that he prefers to run around blocks instead of stepping up and shedding blockers. This extra time getting to the ball carrier might not be so costly in college, but it could be the difference between a two yard rush and a twenty yard play. Thompson makes about half of his tackles right around the ankles; it will be harder to bring down the best runners in the NFL that way. He is not strong at the point of attack and appears to absorb more force than he delivers. In pass coverage, the linebacker does well playing zone, but seems to struggle in man to man situations chasing someone all-round the field. Thompson has a little Troy Polomanu to his game with his gambling tendencies when he instinctively jumps gaps and/or launches himself towards targets when the outcome has not been decided. Pros: His first weapon is versatility, because he can line up as a strong safety, and as an inside or outside linebacker. He is an explosive, instinctive player than finds the ball quickly. For some reason, the backer is a fantastic open field tackler. This is even clearer when he played the gunner position on kickoffs as the play maker would scream down the field and knife between two blockers to bring down the returner. Thompson has good balance, a decent motor, keeps his arms extended to created distance between himself and the blocker while moving almost as quickly laterally as he does north and south. While he can rush the passer with a great first step, the backer plays best on delayed blitzes, but can put good pressure on the opposing quarterbacks forcing bad throws. The defender does a good job reading the signal caller’s eyes and drops back into coverage with effortless fluidity. He covers tight ends well staying hip to hip with them, but would also line up against slot receivers. Thompson usually got more handsy with the wide outs to slow them down. There were a few times he would make a break on the ball and his old running back skills would come back with some solid interception returns. The backer also has a good chop that forces the ball out when the runner least suspects. Overall thoughts: Although I love his athletic gifts, Thompson could be hindered by the role he gets plugged into. Last year the Browns Christian Kirksey was not as impactful as he could have been. Another example is the Steelers speedster, Ryan Shazier, who still has not made an impact, but that was more due to injuries than overall play. Get excited, but tread lightly. « Devin Funchess: What is he a receiver, tight end or both?